Users and resources can be assigned to things, but . . .
To delete multiple resources, go to the Resources Tab, open the action menu and select Bulk Delete Resources. Note, if a resource has any previous work history (e.g. completed to-dos, logged time) the system will automatically archive the resource for audit and reporting purposes (they can be unarchived if needed). To mark resource as not assignable, on the Resources Tab -> Status column, and select Non-assignable. Marking a resource as not assignable removes them from any drop-down menu. For example, if you have an employee who is on maternity leave, or freelancer you hire periodically, you can mark them as not assignable today, and then mark them as assignable in the future. 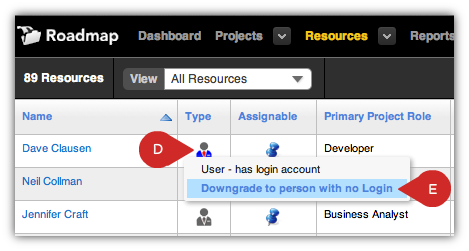 You can delete individual resources from the Resource 360 page by clicking the trash can icon.